Trekelland Bridge | Launceston Then! Trekelland Bridge in 2014 by Roger Pyke. 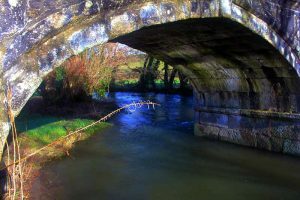 Trekellearn Bridge, anciently Trekelryn, and now corruptly know as Trekelland, over the River Inny carries traffic using the road between Liskeard and Launceston in Cornwall. It is thought to date from around 1500 although there is no record of its building, but it possibly be the nameless bridge for which Bishop Oldham granted an indulgence on August 23rd, 1504. The main structure is of dressed granite and the pointed arch soffits are four-centred Elizabethan style. The parapets, with refuges over the cutwaters (the projections into the river at the bridge piers), are constructed of random Delabole slate. The bridge has two main arches of 5.8m and a floodwater arch of 2.7m span. The carriageway is 3m wide. 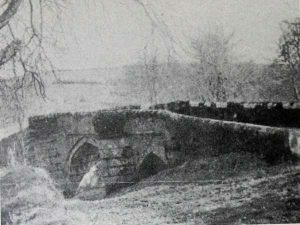 Trekelland was the only bridge on the River Inney to survive the flood of 1847. The bridge carries the main B3254 Launceston to Liskeard road and in recent years has suffered from annual damage to its structure. Trekelland Bridge in the 1940’s. The River Inney passes under Trekelland Bridge.